The earthquake and subsequent fire damaged and destroyed many areas of San Francisco. This interactive map was developed to show you vividly how specific areas of the city were affected. 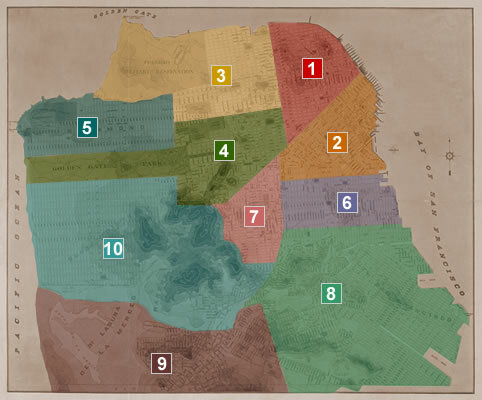 The map divides San Francisco into ten regions, each of which can be searched for photographic images taken in that region. Within some regions so many photographs were taken that we had to subdivide those regions into more discrete sections to assist your viewing and understanding. There is also the possibility to search for more general views such as cityscapes, panoramas and aerial views, as well as for images of unidentified locations. Click any numbered region on the map to search images from that particular region. Images of locations outside of San Francisco may be searched by county name via the Browse page.